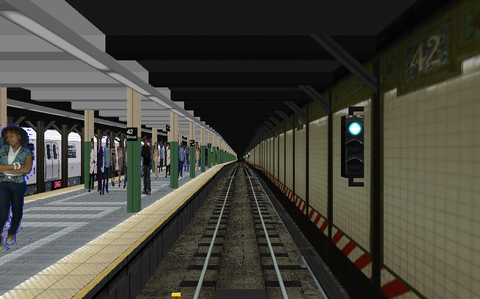 Line R in New York's subway (the Astoria line, the Broadway line and the 4th Avenue line, all former BMT) for the class R-46 subway train. This line starts at Astoria - Ditmars Boulevard in Queens. It is going via Manhattan to Bay Ridge/95th Street in Brooklyn. This is the route the R line had until May 24, 1987. The team behind this route provides a well-done and beautiful simulation of the highest class. Stations, trackside objects and the urban environment is detailed. Soft curves and realistic switches, announcement of stations and connections. This route is released as a Beta version. A few switches are shown leading in another direction than the train actually goes. Everything on the Broadway line.